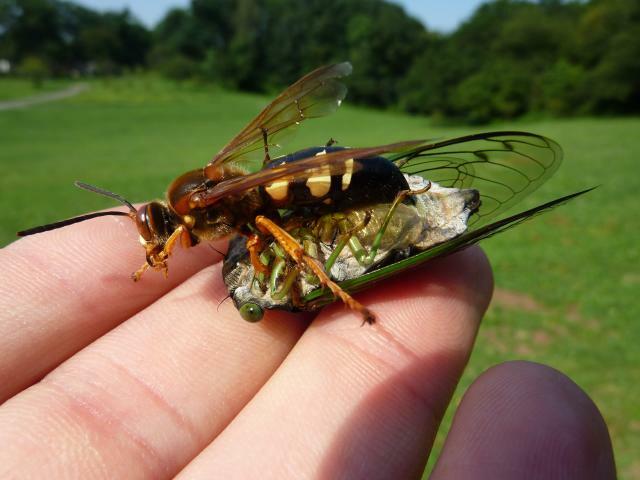 Eggs hatch in two to three days, and larvae begin feeding on paralyzed cicadas. Feeding continues for four to 10 days until only the outer shell of the cicada remains. The larva overwinters inside a silken case. Pupation occurs in the spring. There is one generation per year. Cicada killers are not dangerous, but they can be a nuisance. If you believe control is necessary, treat the burrows after dark to ensure the female wasps are in their nests. The males normally roost on plants near burrow sites. They can be captured with an insect net or knocked out of the air with a tennis racket during the day.